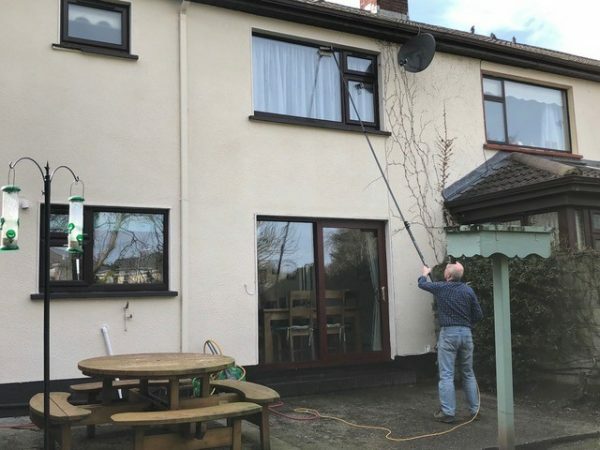 Window cleaning is the core service of my business and a job i really enjoy doing! For most customers, I clean exterior windows on a regular rota and offer internal window cleaning “on request”. I do all the cleaning myself (no random “workers” arriving at your property) and if you have locked gates or if you want the inside windows cleaning, I can text the day before to let you know I’m coming. 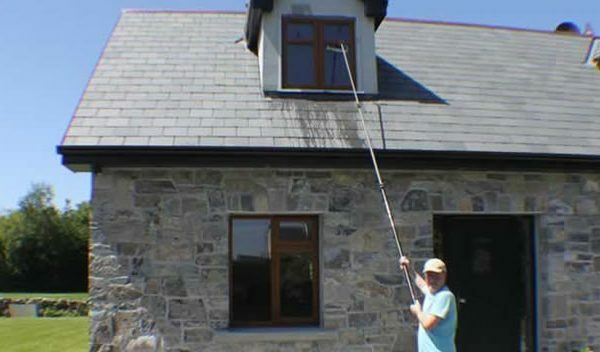 Pure water window cleaning is the industry standard these days, but I like to stay ahead of the curve! Not only does my cleaning system use ultra-purified water, it also heats it. It makes sense that hot water cleans better than cold – you wouldn’t wash your dishes with cold water, so why would your windows deserve any less! I carry this pure water in a tank in my van and this is pumped up the pole and out of specially designed jets built into the brush head. 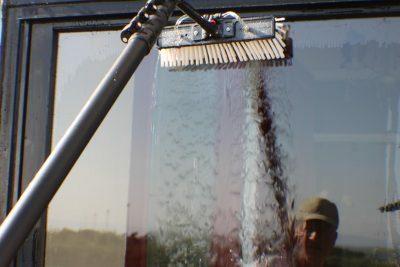 The dirt on your windows (glass, frames and sills) is agitated by the brush and is dissolved into the pure water. The final rinse stage washes it all away. The windows are then left to dry naturally to a spot free finish. 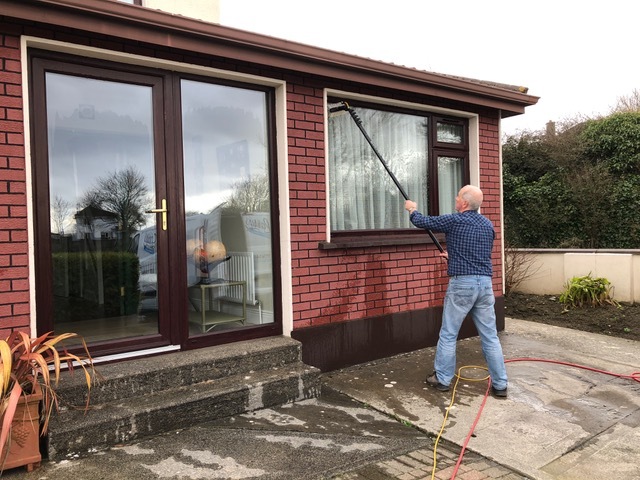 I offer professional window cleaning services in Annaghdown, Athenry, Barna, Bushypark, Claddagh, Claregalway, Clarinbridge, Corcullen, Craughwell, Dangan, Derrydonnell, Doughuisce, Galway City, Kilcolgan, Kinvara, Knocknacarra, Maree, Menlo, Merlin Park, Mervue, Moycullen, Newcastle, Oranmore, Oughterard, Rahoon, Renmore, Renville, Salthill, Shantalla, Spiddal, Westside – – And everywhere in between! I called Larry and I must say he was very helpful; we arranged a time for him to call round and give us a price. We were very pleased with the quote and asked him to do the work. I must say from start to finish we were very impressed with his professionalism and work. 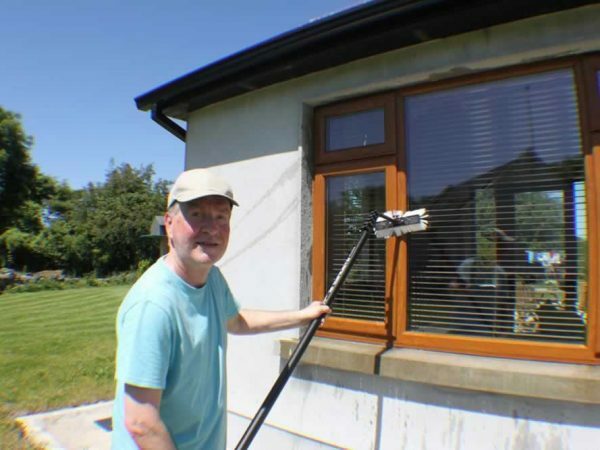 Our windows were perfectly finished and we have asked Larry to clean our windows regularly. We would both recommend 'Larry's Cleaning Service'. I booked Larrys Windows to wash the windows at my house a fortnight ago. I was delighted with the job and it was very obvious that Larry takes great pride in his work and strives to provide an excellent service. I found him to be very efficient and thorough and would have no hesitation in recommending him to anyone. Larry cleans my windows on a regular basis. I'm very happy with the service he delivers. He is reliable, trustworthy, punctual and very pleasant to deal with. Anything you ask him to do, he does with great enthusiasm. He pays attention to detail and is a perfectionist. I have no hesitation in recomending him to family and friends. 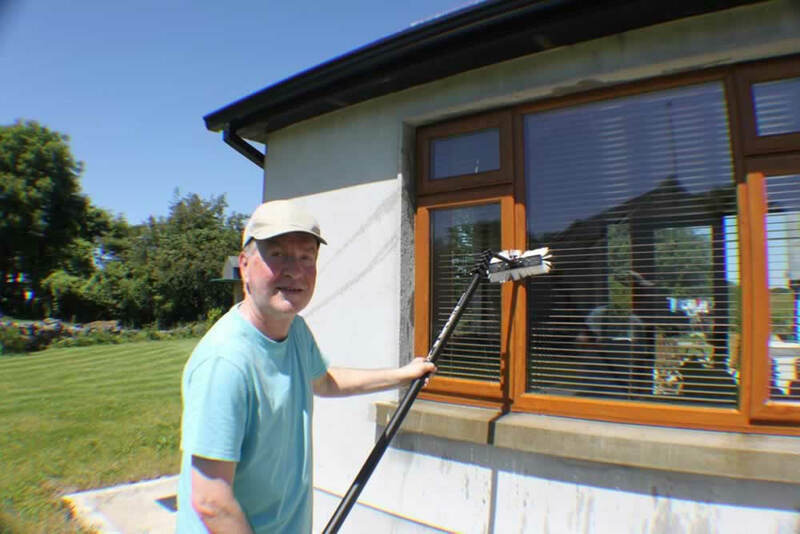 Larry comes to me on a regular basis & always does an exceptional job, his professionalism and courteous attitude always gets my windows done efficiently. I would highly recommend Larry's window cleaning service to anyone. Use the form below to contact me via e-mail. I aim to respond to all e-mail messages within one working day, but if your query is urgent it may be quicker to contact me by phone. 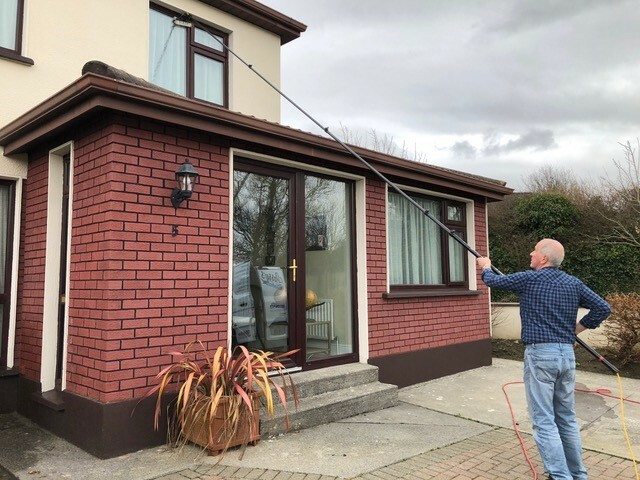 My name is Larry O’Flaherty, and since I started my business I’ve focused on providing my customers with a reliable, regular service and the highest level of cleaning and attention to detail. Contact me on 087 1174148 with your enquiry or to schedule cleaning at your home. 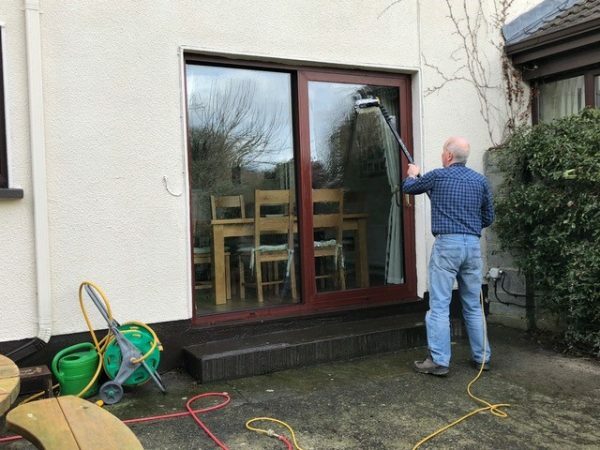 Doors and window frames cleaned as standard!